First son of Sir Richard Wentworth, of Nettlestead, de jure 5th Lord le Despenser, by Anne, dau. of Sir James Tyrrell of Gipping, Suff. Married by 1524 Margaret dau. of Sir Adrian Fortescue of Salden, Oxon., by whom he had eight sons, inc. Sir Thomas, and nine daughters. Kntd. 1 Nov 1523; suc. family 17 Oct 1528; cr. Lord Wentworth of Nettlestead 2 Dec 1529. J.p. Suff. 1523-d; commr. subsidy 1523, 1524, coastal defence 1539, benevolence 1544/45, musters 1546, relief, London, Suff., royal household 1550; other commissions, Suff. and eastern counties 1534-45; member, household of Duke of Suffolk by 1524-?8; PC by 7 Aug 1549; chamberlain, the Household Feb 1550-d.
Thomas Wentworth's family, whose ancestors were of Wentworth Woodhouse, Yorkshire, had acquired Nettlestead by a mid 15th century marriage with the Despensers: Roger Wentworth (d. 1452), younger son of John Wentworth of North Elmsall, Yorkshire, acquired the manor of Nettlestead, Suffolk, in right of his wife Margery (1397- 1478), daughter of Sir Phillip Despenser and his wife Elizabeth, daughter of Robert de Tiptoft or Tibetot, last baron Tiptoft of the first creation and lord of the manor of Nettlestead. The father of Thomas Wentworth, Sir Richard, who served twice as sheriff of Norfolk and Suffolk, also owned land in Cambridgeshire, Essex, Kent, Lincolnshire and Yorkshire. Wentworth married, about 1520, Margaret, elder daughter of Sir Adrian Fortescue, by his first wife, granddaughter and heir of John Neville, marquis of Montagu. Sir Anthony Fortescue and Sir John Fortescue were her half-brothers, and her half-sister Elizabeth was the wife of Sir Thomas Bromley. The first known reference to Thomas Wentworth concerns his service in 1523 under the Duke of Suffolk in the French campaign, when he was knighted at the surrender of Roye with his cousin, Edward Seymour. He may have been already a member of Suffolk's household, for in the following year, as a commissioner for the subsidy levied upon it, he returned himself second on the list with an assessment of £50. In 1527 he was a member of the household of Henry VIII's sister Mary. On the death of his father in 1528 Wentworth succeeded to Nettlestead with five other Suffolk manors lying northwest of Ipswich, and five manors in Yorkshire; he was also to enjoy rights in Kentish and Lincolnshire property after feoffees had taken the profits for ten years. The following year saw his only known return to Parliament, although he may have sat in 1523, when the names of the Suffolk knights of the shire are lost. Returned in the autumn of 1529, he was not to sit in the Commons for more than a few weeks after the Parliament opened on 3 Nov; one of the four Members elevated to baronies, perhaps par parole, early in the session, he took his seat in the Lords on 2 Dec. Three years later Cromwell put forward Arthur Hopton as Wentworth's replacement in the Commons, but the outcome of the by-election is not known. The Thomas Wentworth, whose nomination as one of the knights for Yorkshire was passed over in favour of Sir John Neville at the same time, was a distant kinsman. Wentworth may have owed his ennoblement to his close association with the Duke of Suffolk. His attendance in the Lords was erratic until the accession of Edward VI, and he was absent from the House for an entire session in 1533 and while the attainder of his father-in-law was under review in 1539. Little has come to light about his part in its proceedings. In 1529 he was one of the signatories to the draft of a measure to resolve problems arising from uses. He signed six Acts passed during the third session of the Parliament of 1547 and the bill assuring lands to the city of London which was to be enacted a year after his death. His career was to show him as a constant supporter of government policies, whatever their religious implications. He adopted with apparent sincerity Reformation principles, and to his influence John Bale attributed his conversion. Subsequently he took some part in the proceedings against heretics, but probably with much reluctance. In 1530 he was one of those who signed the letter to Clement VII asking for the pope's consent to the royal divorce of the King Henry VIII and Catalina of Aragon. He took part in the impeachment of both the Queens and all the noblemen brought to trial from 1536 onwards. His decision against Anne Boleyn may not have been without bias as he was a cousin of Jane Seymour. In 1532 he attended the King on his visit to Calais to meet Francois I. On the outbreak of rebellion in the summer of 1536 he was ordered to attend the King with 100 of his men and in the following Oct the 3rd Duke of Norfolk asked the King to empower Wentworth ‘to take the chief rule’ in Suffolk during his own absence in the north. A year later he attended the christening of Prince Edward, handing the water to the godfathers, Cranmer and Norfolk. Present at the reception of Anne of Cleves in Jan 1540, he was host to the King and Catherine Howard at Nettlestead later in the same year. In 1543 he campaigned in the Netherlands and in 1544 in France. From 1523, when Wentworth had first been put on the Suffolk bench, he was in local management. It was perhaps in return for some favour from Cromwell that in 1531 Wentworth gave him an annuity of £5 from the manor of Nettlestead. He corresponded on a number of topics with Cromwell, to whom he was to write as late as Feb 1540, ‘I shall not fail to favour whomsoever you shall hereafter command me to befriend’. In 1538 a certain William Lawrence reported to the minister that Wentworth had helped in the secret transport of an image of the Virgin Mary by ship to London and that he had done much good in quietening controversies in Ipswich, ordering their instigators to reform and to ‘speak the sincere gospel’. In the same year Wentworth himself wrote to Cromwell, as founder in blood of the Greyfriars of Ipswich, to object to the friars’ sale of their plate and jewels: the order, he declared, was ‘neither stock nor graft which the heavenly Father had planted, but only a hypocritical seed planted of ... the Bishop of Rome’, adding that he had purchased the site of the priory for himself and his heirs. Wentworth's religious views influenced the careers of two men who were to become notable Protestant preachers and writers. It was at his request that in 1538 the parishioners of St. Lawrence, Ipswich, appointed the newly ordained Thomas Becon as priest of the chantry of Edmund Daundy; Wentworth described Becon to Cromwell as a man ‘well learned, a true preacher of the word of God, a great setter forth ... of the King's most just and lawful title of supremacy, approved by God's word’. John Bale, later a prebendary of Canterbury and Bishop of Ossory, must have known Wentworth while a friar in Ipswich; in his writings he acknowledged that Wentworth had brought about his conversion. Wentworth's official attitude towards dissent may have caused him some heart searchings, and Foxe was probably right when he described, in his account of the trial of two Protestant martyrs at Ipswich in 1545, how after giving judgment for burning Wentworth ‘did shroud himself behind one of the posts of the gallery and wept’ during its execution. With the succession of Edward VI Wentworth could look forward to advancement as a kinsman of the Protector Somerset and a friend of reform. In accordance with the late King's wishes he received the stewardship of all the lands of the Bishop of Ely in Norfolk and Suffolk; he was also given temporary custody of the younger children of the Earl of Surrey. He did not benefit by Henry's will, but in Feb 1546/7 William Paget declared that it was the late King's intention that Wentworth should be granted the stewardship of all the bishop of Ely's lands. When the crisis came in 1549, however, it was not Somerset but the Earl of Warwick whom Wentworth followed. He accompanied the Marquess of Northampton in the first attempt to suppress Kett's rebellion and he sat on the commission which subsequently tried prisoners at Yarmouth. He was admitted to the Privy Council somewhat earlier than his first recorded appearance at its meeting of 9 Oct. 1549, for on the previous 7 Aug he had joined with Somerset and others in signing a letter to the mayor of Southampton about a prize court case, but his allegiance to Warwick is proved by his inclusion among the six lords appointed on 15 Oct to be governors of the King's person and education. He was also made one of a quorum of two among the group of Councillors responsible for the finances of the Household and the army, a commitment which was to be followed by his appointment as chamberlain of the Household in succession to the 18th Earl of Arundel, who had sided with Somerset. He held this post for little more than a year before his death in 1551. Wentworth had shown no personal interest in acquiring monastic property, except for the Blackfriars at Ipswich and a lease for 21 years from Mar 1537 of Newsom manor in Lincolnshire. In Apr 1550 he was granted the lordships and manors of Hackney and Stepney, valued at over £245 yearly, and two months later, in recognition of his service under two monarchs, the former abbot's house at Westminster. 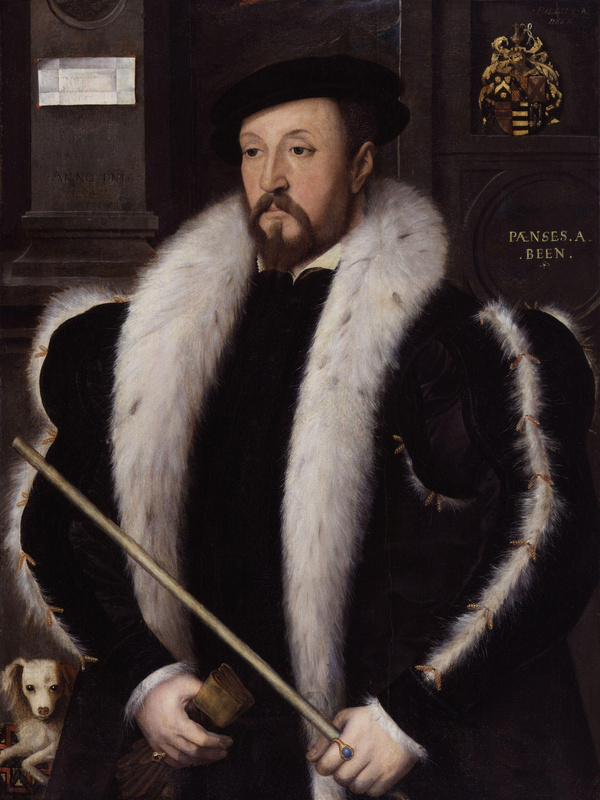 He died in the palace at Westminster on 3 Mar 1551 and was buried in great state in the abbey. According to Edward VI all but one of his 17 children survived Wentworth. By a will made on 16 May 1544 he had left marriage portions of 200 marks to his nine daughters and £10 yearly to his seven younger sons on their majority. These bequests were payable from manors in Lincolnshire and Yorkshire. Wentworth left to his wife for life all the manors (unspecified) which he had acquired from Nicholas Astley, clerk, and a share of all household goods except plate. He directed that some of his property in Ipswich should be sold to pay off a mortgage on lands in Kent. Any ambiguities in the will were to be referred to James Hales, serjeant-at-law. It was proved on 27 Nov 1551 by Wentworth's eldest son Thomas, the executorship having been renounced by the widow and John Gosnold. 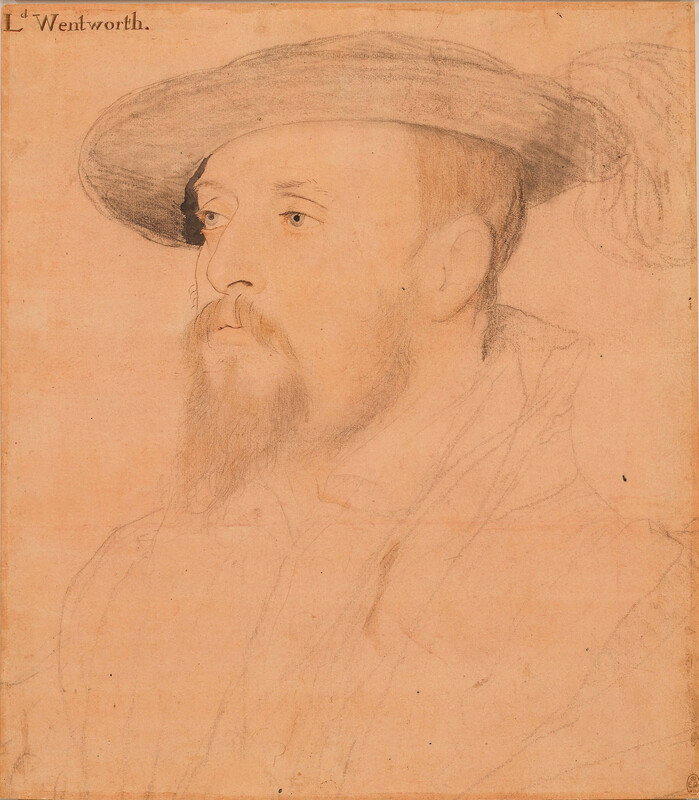 A drawing by Holbein and several portraits of Wentworth survive.